As the oil price decrease has a negative impact on government revenues and lending conditions, many businesses face liquidity issues and payment delays. Domestic politics are influenced considerably by the ruling families and traditional tribal structures. Political parties or trade unions are not permitted and opposition is virtually non-existent. The Federal National Council (FNC) as a legislative body has only an advisory role. However, political liberalisation has seen some limited progress, at least when compared to other states in the region. The UAE is part of the alliance against the Islamic State (IS), and as such it has launched air strikes against IS in Syria and Libya. This engagement has principally increased the risk of terrorist attacks in the UAE. However, the security forces are considered competent and effective. Overall, there is no indication of large scale concerns about security. Despite its diversification, (70% of total GDP coming from non-oil sectors) the UAE’s economy has been impacted by the direct and indirect consequences of the oil price decrease. Lower oil prices have impacted government revenues, which in turn has affected government deposits in the banking sector, resulting in tighter lending conditions. 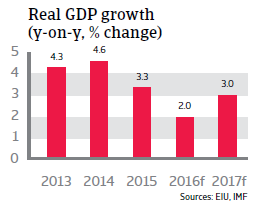 Due to lower fiscal revenues, declining liquidity in the banking sector and weaker business sentiment, GDP growth is expected to decrease to 2% in 2016. 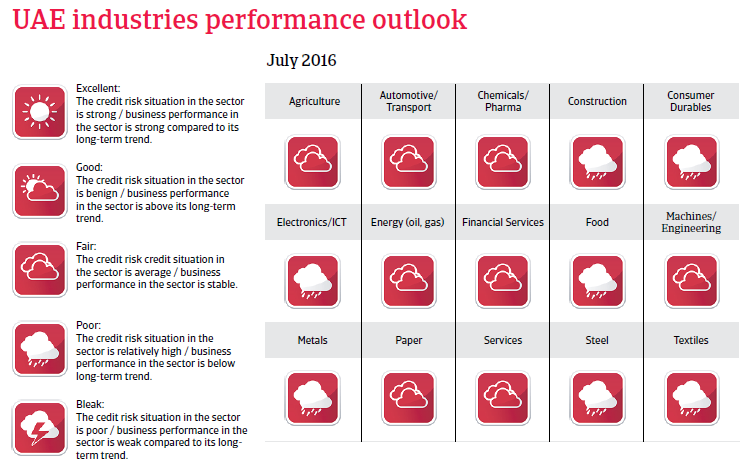 Since Q4 of 2015 the businesses in the IT, consumer durables, food, metals, steel and construction sectors face increasing troubles. The services sector in Dubai is affected by decreasing tourist visits (from Russia and other Gulf countries), weaker demand for housing and lower investments. Commodity price volatility (especially steel, metals, food commodities) in 2015 has negatively impacted various traders and distributors, who are facing liquidity/cash flow issues and have either delayed payments to suppliers or, in some cases, just shut down their businesses. 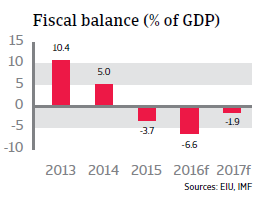 The budget deficit is expected to increase to 6.6% of GDP in 2016 from 3.7% of GDP in 2015. While spending has been cut, it is not enough to offset the decline in revenues. It is expected that subsidies on fuel, water and electricity will be further reduced and new taxes introduced. This, together with a gradually rebounding oil price should lead to a much lower deficit in 2017. 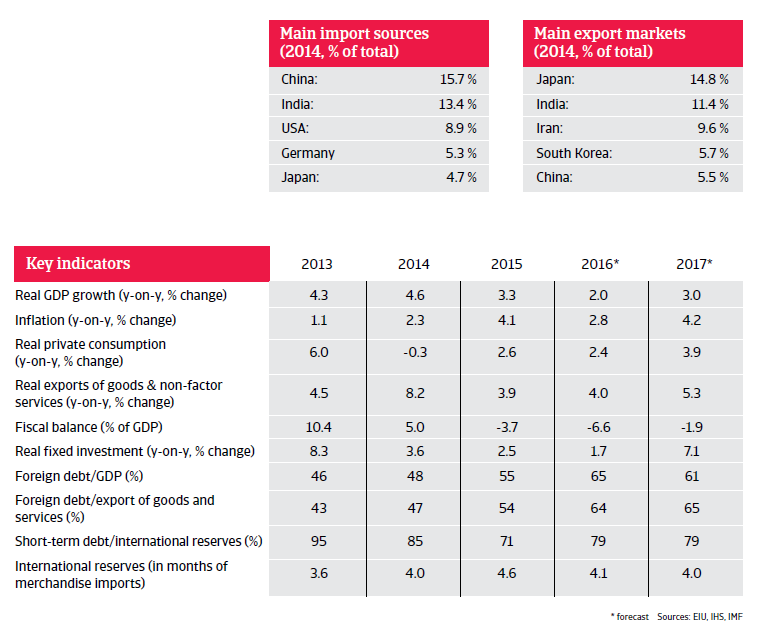 The current account is expected to turn into a deficit of 2.5% of GDP in 2016 due to lower export revenues. 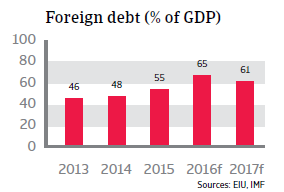 As a consequence of this and high debt service, the UAE´s external financing requirement is high (120% of foreign reserves). However, due to its ample foreign currency assets (reserves and sovereign wealth funds) the UAE is able to easily finance increased spending. Although the UAE’s solvency position is considered to be strong, Dubai´s government and government-related entities are still highly leveraged. With a debt level of USD 143 billion, there are still concerns that Dubai could face financing difficulties. However, through a combination of refinancing, sale of assets and repayments, this should be manageable – as long as investor sentiment does not significantly deteriorate in the future.